Logitech was the one third party accessory company that brought out keyboard cases for the first two generations of the iPad Pro right after release. They were also the only ones besides Apple to make use of the Smart Connector for their keyboards, rather than relying on Bluetooth. Their Create cases for the original Pro were a bit heavy and bulky, but had great backlit keyboards. The Slim Combo cases that they released right after the 2017 iPad Pros were even better. In fact, the Slim Combo for the 12.9″ Pro is still my favorite keyboard case of all time. It was a near-perfect balance of protection, portability and utility. Unfortunately, Logitech has been noticeably late to the party this time out. Apple’s latest Pros were released in the Fall of 2018, but up until now we’ve had radio silence. As such, Apple’s Smart Keyboard has (unfortunately) been the only game in town. 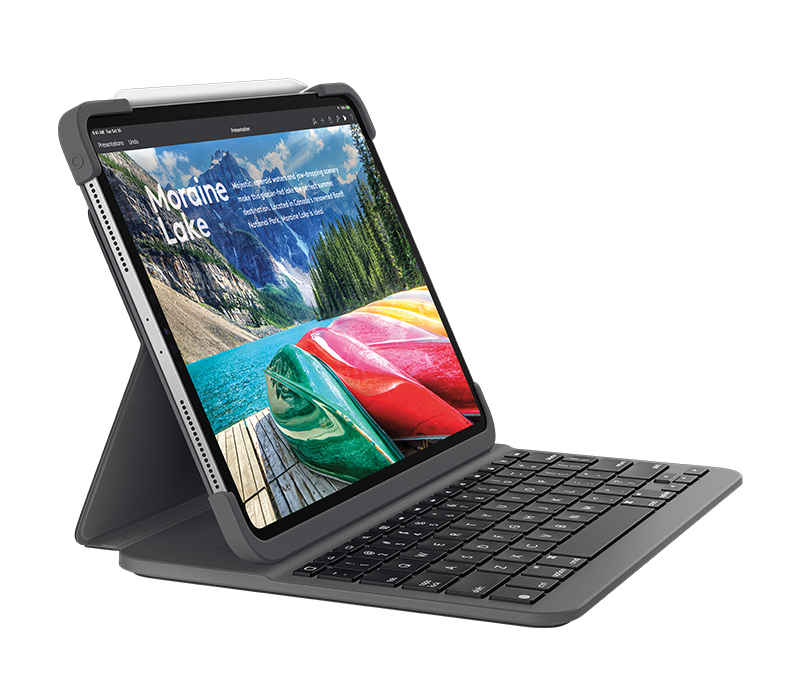 Thankfully that changed today, as Logitech has once again announced a keyboard case for the latest iPad Pros. Logitech’s new case is called the Slim Folio Pro, and it brings some familiar features, but one major change over their previous products. As for the familiar, we will get a Logitech keyboard, which usually have great spacing, feel and response. The keys will be backlit and there will be a dedicated function row of keys, both of which set Logitech’s keyboard cases apart from Apple’s Smart Keyboard. Based on my past experience, I have no complaints here. While a lot of the Slim Folio Pro’s features look very familiar, there is one major difference with this new keyboard case. 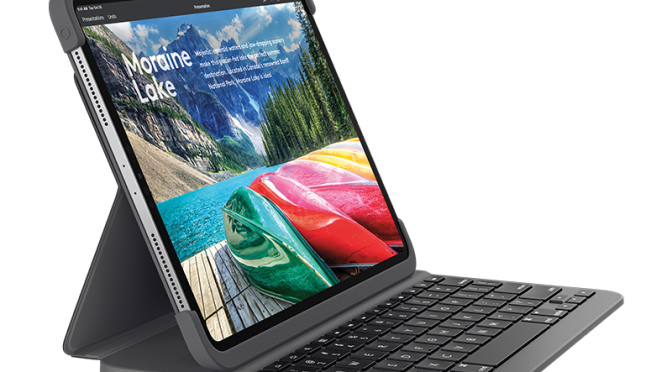 This is the first of Logitech’s three iPad Pro keyboard cases to not include Smart Connector support. The Slim Folio Pro reverts back to Bluetooth to connect to the iPad. This is likely related to the fact that Apple moved the Smart Connector to the back of the iPad Pro for this generation. While the battery life of Bluetooth keyboards is great and I can attest to the fact that Logitech’s hardware has a great track record when it comes to quick and solid connection between keyboard and device, this is still a shift that can’t be ignored. I can’t help but go back to a comment that Rene Ritchie made in a podcast after the iPad Pro release. I remember him mentioning that an Apple employee in the Demo Room said the new Smart Connector would NOT be part of the MFi program this year. You can’t always take such comments at face value, but looking at the fact that Logitech has now shifted its iPad Pro keyboard case design, there may be something to it. Maybe Apple really isn’t allowing third party developers to use that connector. Maybe they are just biding their time and will open it up later. Maybe Logitech either couldn’t get it to work, or just decided to make a change. Hopefully we will find out at some point. In the meantime, I’m just glad to have a new keyboard case from Logitech coming soon. The Logitech Slim Folio Pro is available for the 11″ and 12.9″ Current Gen iPad Pros for $119 and $129, respectively. I will review the new Slim Folio Pro for the 12.9″ iPad Pro as soon as I can get my hands on one.